I really wasn't looking forward to watching this but used it as an excuse to watch a film with the family unit and could still scratch something off the subset list (even though my kid had already seen the movie at the theater last year). I have to saw I was extremely pleased. Lots of adult jokes with kiddie pleasing gags as well. The animation, while kinda ugly and odd, is also very cool and unique looking. The movie had some extremely spooky parts mixed with fun and this would be a great intro into horror movies for kids. My kid does not like anything scary but he really enjoyed this movie. My favorite part was the guy trying to decide whether to wait for his "Greasy Pieces" from the vending machine or run from the zombies. At home alone and just started watching this before remembering that I have a wife and daughter that may prefer I wait. Some of the character design is kinda quirky, but the story more than makes up for that. There is just the right amount of sugar coating on the deep moral satire to please the viewers of all ages. I really want to see this on Blu-ray because the Netflix stream just flattens the heck out of a picture that I know should have a great depth of field even in 2D. I really enjoyed Paranorman. The art style has a claymation softness that's appealing and unique. It's insane to me that they made an actual kid appropriate zombie film. The town "riot" segment is fun and pushes the film into a kinetic chase segment. It took a while to get to the greenish hued night chaos scenes that made Paranorman fun but once it did, it was a blast. I really liked the bittersweet end focusing on childhood innocence. 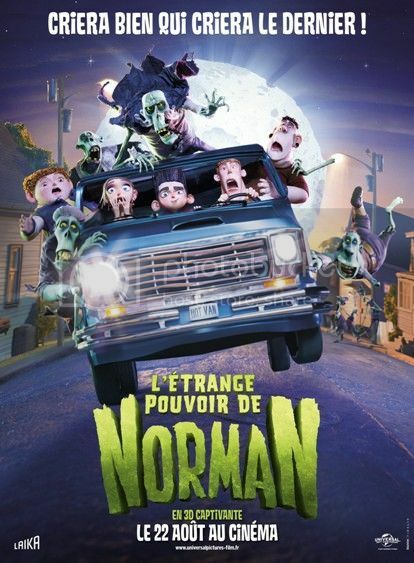 I tried to watch this with my 5 year old but she got too scared about 30 minutes into it (especially the "boss zombie") and so I ended up watching it myself but still enjoying it... and it turns out she watched most of ParaNorman peaking out a door down the hallway anyway because apparently it's good "when the zombies aren't out." Last edited by Undeadcow; 10-14-13 at 09:45 PM. 1. The score--Absolutely lovely in parts, appropriately bombastic in others. I'm listening to a stream of it right now. 2. The design--I don't think that there are any straight lines in this movie. Everything is a little askew, but it works. As an example, I noticed that the irises of the eyes of every character are slightly different sizes. 3. The mood--I adore the beginning of the film, which is oddly melancholic. That's something that you rarely see in an animated film. 4. The voice work--No weak links here, with particular kudos going to the two boys and Norman's sister. 5. The humor--my favorite line: "Don't make me throw this hummus--it's spicy!" Yeah, I'll be adding this one to the collection real soon. I watched it on Netflix, and it looked great, but I'll bet that it really pops in Blu-ray 3D. I can't wait. Last year (or sometime) I was able to get the DVD with enough time to watch some of the extras, and I was awfully impressed with the detail and effort they put into the claymation. They had glassblowers make tiny streetlights and then wired them up to work properly! Really, really complex and intricate work that is quite possibly going to be lost on CGI-jaded audiences unless they actively watch the special features. There's also the completely unnecessary throwaways - Neil again, wanting to play hockey, and lurking outside in a "Jason mask" - which add something indefinable. Be sure to watch the extras! I thought this was great. For those who don't realize, this was stop motion animation, not CGI. I thought it had the flicker commonly seen with stop motion animation, but it looked too clean and had to be CGI. I was impressed to find out after the movie that it was in fact stop motion animation, they did a great job. After the credits they show time-elapsed footage of how they made Norman. That means they built all of the puppets/models, sets, lit everything and shot them with cameras. I thought it looked gorgeous, I loved the neon green and purple lighting. The movie itself was very entertaining. The voice actors all did a good job, I thought each of the characters had some great moments and I found myself laughing quite a bit. The story felt a bit like a less depressing version of Silent Hill, and had some touching moments. The finale was surprisingly intense and dramatic. I loved the music, it reminded me of the pulsing soundtracks from Zombie movies of the 70s and 80s. I liked the role reversal of the humans chasing the zombies down and concur with a poster who brought up the guy waiting for his bag of chips to drop as the zombies shambled closer to him, the movie was full of amusing moments like that. I went over to IMDB to read some of the comments and of course most of the posts were complaining about the final line of the movie where a character reveals he's gay. I personally thought it was hilarious. Any of the people who had an issue with it seem to miss the entire point of the movie which warns against judging people who are different. Halfway through the month and I'm surprised to say that one of my favorite movies so far is a PG animated movie. Great pick! I loved the final line because as someone who was bullied I love the fact that it tries to show that we should embrace who we are and not let others get the best of us. I think this is becoming more and more important in today's culture but that's a whole other discussion. I laughed a lot in this movie, such funny lines. I thought the film looked good with the claymation. It also has a great story with symbolism that is realistic and I could relate to in a sense which made in enjoyable. Second time watch for this and I liked it, but not quite as much as Frankenweenie which I watched for the first time last night. This one does have some great characters and feels like the kind of '80s films of my youth like The Monster Squad and The Goonies and I think that's what I appreciated the most. BTW it was pretty funny hearing a Dizzee Rascal song in this movie, when Alvin was "break dancing." I need to re-watch this one. I remember enjoying it but I had seen Frankenweenie first, which was a better film in the same genre. I feel exactly the opposite. I watched ParaNorman on Monday night and loved it. Afterwards, I popped in Frankenweenie, but I gave up on it after about thirty minutes because, after ParaNorman, I found it to be deadly dull. I'll give Frankenweenie another spin in a few weeks to see if I like it any better. This was more of a fun animation movie but Frankenweenie really hit home for me with the story being about a kid and his pet. I also really liked the vintage styling. I really liked this movie. Great voice acting, the story was engaging, and there were some truly scary moments mixed in with humor. I enjoyed the animation and can see myself watching this movie at least once a year. I'll have to buy a copy. Thumbs up from me. If i ever decide to buy a 3D projector, this is one of the first movies I would buy for it. Frankenweenie is slow at the start... you have to give it more than 30 minutes but it's got a nice climax. Ultimately I think ParaNorman is more consistent and entertaining overall but FrankenWeenie shouldn't be overlooked if you're in the mood for family friendly entertainment. I'm definitely on team Frankenweenie, but both are among the best animated films I've seen in years. I think I like this one a bit more than Frankenweenie, but both will need repeat viewings to really decide. I may make 2014 horror in every Challenge, so I'll see them again in August. In an example of poor planning on Amazon's part, they had this as a lightning deal yesterday. Only reason I am posting again is because so many brought up Frankenweenie in this review. I watched it tonight and found it to be deadly dull and emotionally forced. It came nowhere close to being as entertaining as ParaNorman. I'm pleased - particularly since recent comments seem fairly anti-family friendly 'horror' - that the response here seems to be overwhelming positive. I enjoyed it a lot more this year than last year, (and I was underwhelmed with Frankenweenie, too. And terribly unhappy that the original short wasn't on the disc I got).